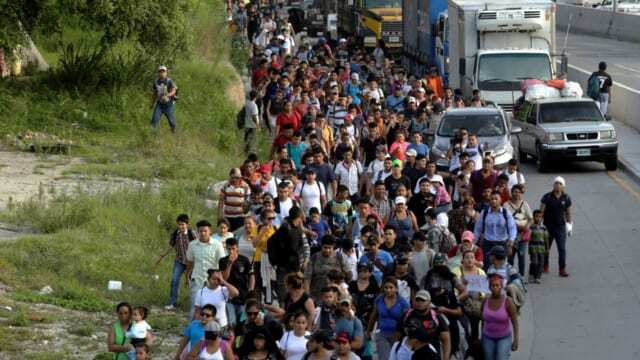 There are “caravans” marching north though Mexico originating from the Central American countries of Guatemala, Honduras and El Salvador. Presently around 1,500 miles away, they get out of their trucks to march for the benefit of cameras with uncannily precise timing to arrive on the precipice of the U.S. November midterm election. Is your spider sense tingling? Are you wondering if this is a scam? So am I. These people are portrayed as refugees; but are they? They aren’t acting like it. There’s a pretty straightforward script about how refugees are handled on this planet. The international law on asylum is that the asylum seeker is supposed to present themselves to the authorities of the first international border they reach upon fleeing their countries. For Central Americans fleeing north from their governments, that country is Mexico; specifically, the southern border of Mexico. The way it is supposed to work, Mexico, with aid from the international community, is supposed to set up refugee camps. The coordination body for this is U.N. High Commission on Refugees (UNHCR). It is from these camps, that other organizations such as the US Office for Refugee Resettlement are supposed to process persons to qualify eligible refugees for movement from the camps to a third host nation. If this were the Middle East, the analogy would be people in Iraq and Syria fleeing ISIS going into U.N. camps in Jordan. Here’s where it gets weird. That’s exactly what the UNHCR, Mexico and United States are trying to do in this case. This is not a money issue. The US, Mexico and the UN have the money and resources to support a proper refugee camp. We’re talking 1,500 people per caravan which is a drop in the bucket compared to the 11 million Syrians, Kurds and Yazidis displaced in the Middle East. But wonder of wonders, these people are refusing to go into camps and process as refugees. Somebody’s giving them a better deal than the internationally sanctioned solution set. Instead, they are marching towards the US border escorted by, and it seems funded by, American activist handlers. What does that tell you is really going on here? Again, are these people really legitimate refugees from their own governments? If so, what exactly are they fleeing? Let’s dig a little more. First, these marchers do come from three relatively small economies. Guatemala has a $75.6 billion GDP nation, El Salvador a $24.8 billion GDP and Honduras has a $22.98 billion GDP. But here’s the thing. As of 2017, the GDP’s of all three of these countries was growing. Yeah, you heard that right, growing. Note that all three of these governments are imploring their citizens to return. And they were doing that before Donald Trump threatened to cut off aid to them. What’s the underlying stress that may be besetting Central America? Here are my observations. First, this may very well have simpler explanations that have nothing to do with being refugee problems. People leaving otherwise improving economic conditions speaks more to internal forces having to do with economic opportunity inefficiencies within these nations. One of the organizers of the caravan is a Honduran ex-lawmaker named Bartolo Fuentes who’s apparently been organizing caravans since last September as reported by the New York Post and Daily Beast. These are normally small groups numbering in the 200 range. According to the NYPost, the swelling in numbers for this caravan may have been triggered by a woman referring to “assistance” in an interview on Hoduran TV news channel HCH. Mr. Fuentes reported a surge in phone calls following the broadcast. What does that mean? Could this be local politics in Central America gone viral on the world stage because of the internet? It’s certainly not the first bizarre consequence effect we’ve seen happen. Or, it may be simple economics in action. It costs an average of $7,000 USD to pay a coyote to smuggle a person to the United States. A caravan with “assistance” reduces that cost per traveler considerably … and potentially upsets the human trafficking economies extending from Central America to the United States. Think about the implications of that one buckwheat. More broadly, what Central American nations do share, actually the entire Western Hemisphere and the Organization of American States, is a common problem called Venezuela. That socialist state is a basket case of a national failure. Venezuela’s economy has collapsed thirty-seven percent (-37%) since 2014 from being a $482.4 billion GDP nation to a maybe $300 billion GDP country today; that’s a loss of $182 billion of GDP by Venezuela. That math basically means that Venezuela has evaporated wealth greater than the combined economies of Guatemala, El Salvador and Honduras. The stresses put on Venezuela’s neighbors because Nicolas Maduro is nincompoop of a socialist despot even by socialist’s standards is a problem now beginning to resonate throughout the New World. My instincts say Maduro is triggering the Western Hemisphere equivalent of the refugee problem besetting Europe. We are facing a problem very similar to the walking wave of people seeking economic opportunity while hanging on to their cultural identity. They, like their migrant counterparts in the EU, are escaping a no go home scenario. The similarity to what is challenging Europe is uncanny; except the problem for the New World isn’t Muslim refugees displaced from their homes in Syria, Kurdistan, Libya, or Sudan, it’s Venezuelans displaced from their homes. The Venezuelans need that $182 billion of lost GDP to survive and like their Muslim counterparts in the Old World, they are pursuing a scrounge at the expense of their hosts path to that desperate survival. Central America is being invaded by Maduro’s refugee hordes. So far, no one has the guts to do something about the cancer that is Venezuela’s blight upon the Americas. This is not going to get smaller as Central and South America’s economies continue to crater under the weight of the spread of that pathetic socialist failure. Stranger still, groups in the US are seeking to exploit the plight of the innocent for their own political purposes, most embarrassingly, by activists and globalists in the United States. The political elite Gringo’s are being ugly Americans using these people like pawns. I doubt they even actually care what happens to them, or their countries. Here’s my reality check. Cooler heads than the American hotheads are beginning to voice their concerns. Eventually, I think the suggestion of Mexican President Enrique Pena Nieto to US President Donald Trump and Canadian Prime Minister Justin Trudeau that the countries of North America, who have strong economies, will have to solve this problem as an Organization of American States problem. It will become front burner policy. My suggestion to President Trump is to seriously consider these posits. We may need to build a coalition of the willing to help Central and South America find a better future without a Maduro led Venezuela. We may need to re-cast how US aid to Central America can be better used to further decrease the attraction of economic migration from these countries. And, we may have to deal with the economic food chain of human trafficking in the New World. There are global repercussions that accompany this strategic realization.